These National Weather Service charts show the forecast of temperature, wind, precipitation and snow over the period of 11 p.m. April 5 to April 7. The National Weather Service has issued a Hazardous Weather Outlook for Ocean County and much of the area, predicting snowfall would hit late Friday into overnight Saturday and continue from rain to snow into Saturday afternoon. However the forecast, issued Thursday afternoon, had the likely amount of snowfall accumulation for our area at less than an inch. “A light accumulation of snow is possible late Friday night into Saturday. However, there remains some uncertainty with regards to amounts,” said the NWS. The hazardous weather outlook was issued for most of central and southern New Jersey, southeast Pennsylvania and eastern Delaware-Maryland. 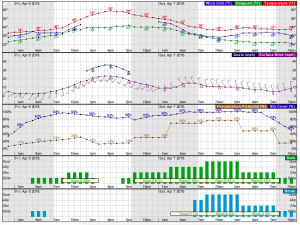 In contrast, Friday daytime is expected to reach into the high 50s – low 60 degree temperature before evening hits. The next NWS outlook is expected Friday.